So it turns out that for the past twenty-odd years, I’ve been making scrambled eggs the wrong way. 1. Don’t salt your eggs before they are in the pan. Typically when I make scrambled eggs I’ll add salt and pepper into the bowl and whisk everything together before I dump it into the pan. Not only are eggs better with just a little bit of salt and butter, but if you salt the eggs first it actually pulls the liquid out of the eggs and dries them out – who knew? So wait until the eggs are cooking in the pan before you add your salt! 2. Don’t add milk or water to your eggs to make them fluffy. Simply crack your eggs into a bowl and whisk them vigorously for a few moments, which actually creates some air in your eggs, making them light and, well, airy! 3. Don’t overheat your pan. I am guilty of cooking pretty much everything on medium-high heat or the equivalent of 8 on my burner settings. Don’t do this with scrambled eggs! 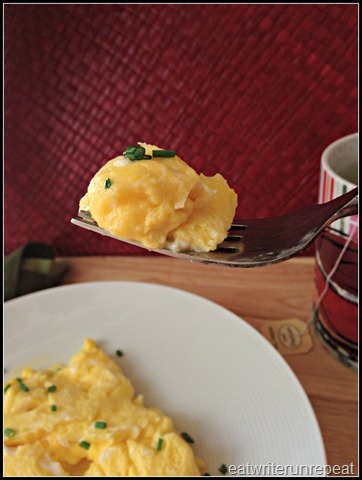 The key is to use low heat – I started using about 5 on the stove to create lusciously creamy, perfect scrambled eggs. 4. Use butter. For years I’ve been scrambled eggs in olive oil. There’s nothing wrong with that of course, but for the perfect scrambled egg it’s better to go simple – and rustic – with some melted butter. Wow. Be careful not to burn or brown the butter (hence the low heat), you just want it barely melted before you add your eggs. 5. Be patient. Once you’ve added the eggs to the pan – wait a few seconds. Let the proteins start to set on the pan, and then – gently and patiently – just sort of swirl the eggs around with a rubber spatula. The key is to create soft egg curds that are just a bit runny when you move them to your plate. In the video we watched it took about 40 seconds from the time Chef Symon added the eggs to the pan until he removed them to the plate. Can you believe it? Delicious eggs in less than a minute! Typically what I’ve done in the past is I’ve used too high a heat setting, and I tend to stir my eggs to death – creating dry clumps of egg that are pretty much overcooked and unappetizing. I also scramble my eggs with a ton of chopped veggies and spices (which is fine if you’re making an omelet), but I’m starting to find that if you keep it simple and serve your eggs with butter, salt, and maybe some fresh chives or a drizzle of truffle oil for a garnish you can create a deliciously elegant breakfast in less than five minutes – start to finish. Now that’s something I can get behind! Preheat your pan on a low heat setting. In a bowl, whisk together three eggs vigorously. Add a healthy dollop of butter to the pan and let it just melt enough to cover the bottom of your pan. Add the eggs to your pan and wait approximately 10 seconds for the proteins to set. Using a rubber spatula, gently swirl the eggs to create soft curds. Salt your eggs as desired. 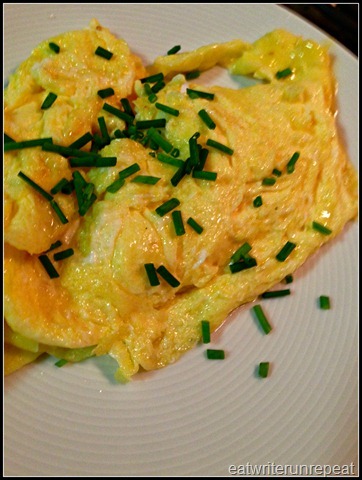 Once the eggs are not yet or just barely set, move to a plate and garnish with fresh chopped chives or a spritz of truffle or olive oil. Serve immediately. 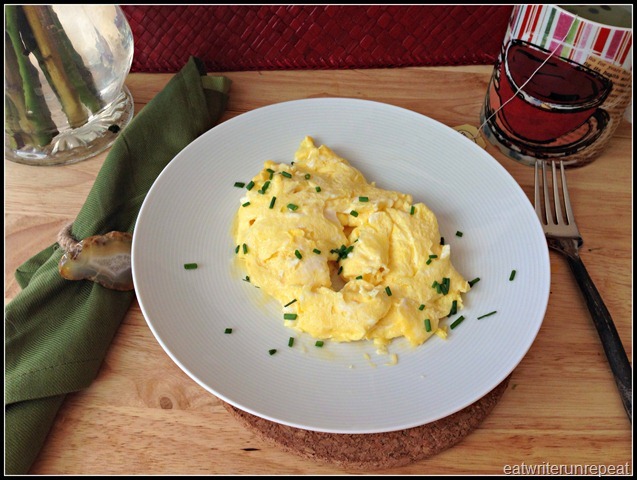 Posted on 2 June 2014 1 June 2014 by BeePosted in Breakfast, Eggs, Paleo, Whole 30Tagged breakfast, cooking technique, eggs, paleo, scrambled eggs, Whole30.